As the end of term approaches, so too do we enter the last phase of our ‘Bounce’ personal development and challenge programme at Cam Woodfields Junior School in Gloucestershire. The final group of twelve young people are near to completing their outdoors project of designing and building a play feature for the grounds of their school, organised by local community organisation World Jungle, working alongside Tom Williams, Director of “Everyday a New Adventure”. This project was made possible with funding from People’s Health Trust using money raised by HealthTotal through The Health Lottery. For more information please contact Ben Ward (ben@worldjungle.org.uk) or visit the World Jungle website (www.worldjungle.org.uk) . After attending, and thoroughly enjoying, Engage for Change’s ‘Understanding Health and Social Care Course’, Jane Manning from World Jungle (Gloucestershire) and Ailsa from Creativity Works talked to Engage for Change about bringing their next course down to Bath and Gloucestershire. So please have a look and sign up by Monday 27th July to commence in September 2015. The course is for people who are interested in learning more about skills and techniques for engaging seldom heard groups in order to bring about improvements in health and social care. The course is suitable for anyone with an interest in or responsibility for engaging groups to improve health such as Local Healthwatch staff and volunteers, community groups, Local Authority Engagement Leads and Clinical Commissioning Group staff. The course is delivered through a combination of online and face to face learning, an online course of study of 30 hours and a final all day session to complete assignments. The course is accredited with the CERTA (Operating name of the Open College Network Yorkshire and Humber Region) as a 3 credit level 3 module (the academic level required is roughly that of an A level). 7th December: Dursley, Gloucestershire at The Chantry Centre. 8th December: Bath, The Guildhall. Please state on your application form if you want a place on the Bath or Gloucestershire FEHSCE. There is a £50 deposit required per learner, refundable on completion of course. Please contact info@engageforchange.org.uk or phone 01274 256 919 for more details and to receive a copy of the application form. Have you heard about Dursley’s Secret Garden? Tucked behind the Chantry Centre on Long Street in Dursley is a beautiful walled space that is being turned into a community garden thanks to ‘Transition Cam and Dursley’ and a number of partner organisations including World Jungle, The Chantry Centre and the Explorer Scouts. The garden is being supported by Stroud District Council’s Food Grants programme with the aim being to produce fresh organic vegetables that can be used in local homes and even businesses as well as share skills in organic gardening, permaculture and other green skills. A wonderful team of committed volunteers meet every Wednesday morning 9am – 12noon, working hard to transform the area in to a beautiful space for the whole community to use. Once a month on a Saturday too, the garden is opened up for a ‘Working Day’ and the community invited in to get involved and be a part of creating something special. The next Working Day in the Secret Garden is on Saturday 20 June. All are welcome (children and families too!) to go along on a midsummer day and see the good work done in the garden so far, do some digging, have some food and meet Transition volunteers. More Saturday events will be announced over the summer. For more information, please contact Ben Ward from World Jungle on 07889 512644, email ben@worldjungle.org.uk or visit http://www.worldjungle.org.uk . Cotswold District Council’s ‘Summer off the Streets’ programme, now in its ninth year, is hugely popular amongst children and families encompassing a varied programme of workshops including arts & crafts, survival skills, sports and circus fun, together with a whole host of free community fun days and events linking in with national campaigns too including National Play Day and Love Parks Week. This year the programme has secured additional support from four County Councillors who have contributed part of their Children’s Activity Funding. In addition to the main programme running throughout the school holidays, there will be four one-week long programmes of events and activities targeted at children and families living in Bourton & Northleach, Tetbury, Stow-on-the-Wold and South Cerney . 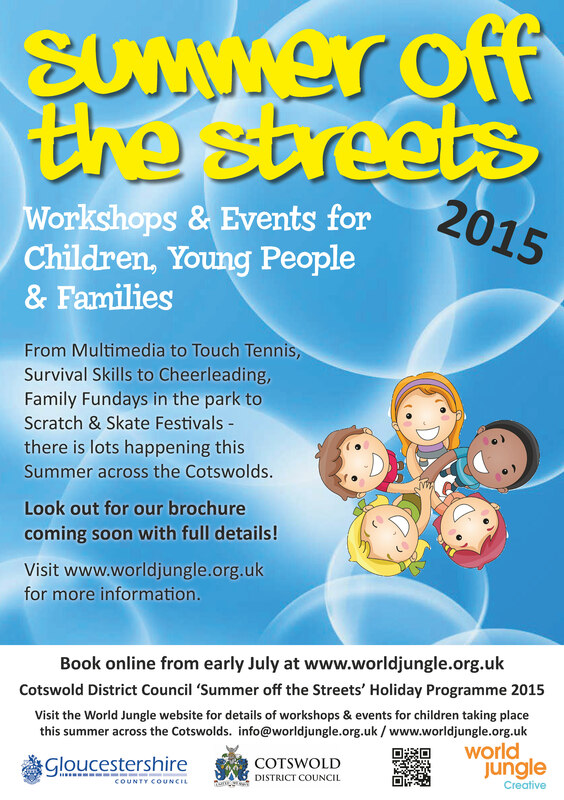 The programme is managed by community organisation, World Jungle. Details of all the events, activities and workshops can be found on their website at www.worldjungle.org.uk. Advance booking for those workshops that require it will open from the first week in July.